﻿ Fun Easy English - Environment - Global warming - Climate change Indicators: Lake Ice. This indicator measures the amount of time that ice is present on lakes in the United States. The lakes covered by this indicator are generally freezing later than they did in the past. Freeze dates have shifted later at a rate of roughly half a day to one-and-a-half days per decade (see Figure 1). 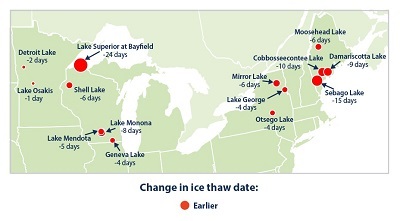 Thaw dates for most of these lakes show a trend toward earlier ice breakup in the spring (see Figure 2). Spring thaw dates have grown earlier by up to 24 days in the past 110 years (see Figure 3). All of these lakes were found to be thawing earlier in the year. The changes in lake freeze and thaw dates shown here are consistent with other studies. For example, a broad study of lakes and rivers throughout the Northern Hemisphere found that since the mid-1800s, freeze dates have occurred later and thaw dates have occurred earlier, both shifting at an average rate of 0.8 days to one day per decade. The formation of ice cover on lakes in the winter and its disappearance the following spring depends on climate factors such as air temperature, cloud cover, and wind. 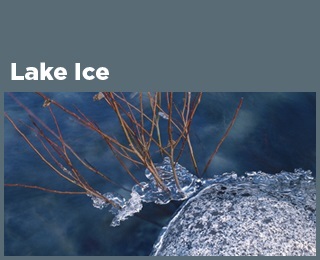 Conditions such as heavy rains or snowmelt in locations upstream or elsewhere in the watershed also affect the length of time a lake is frozen. Thus, ice formation and breakup dates are key indicators of climate change. If lakes remain frozen for longer periods, it can signify that the climate is cooling. Conversely, shorter periods of ice cover suggest a warming climate. The timing and duration of ice cover on lakes and other bodies of water can also affect society—particularly in relation to shipping and transportation, hydroelectric power generation, and fishing. The impacts can be positive or negative. 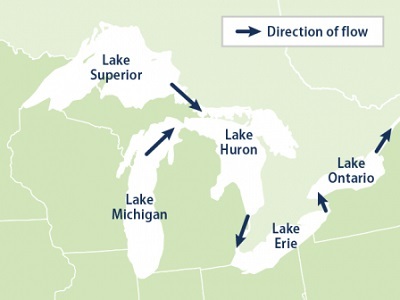 For example, reduced ice cover on a large lake could extend the open-water shipping season but require vessels to reduce their cargo capacity, as increased evaporation leads to lower water levels. This indicator analyzes the dates at which lakes freeze and thaw. Freeze dates occur when a continuous and immobile ice cover forms over a body of water. Thaw dates occur when the ice cover breaks up and open water becomes extensive. Freeze and thaw dates have been recorded through human visual observations for more than 150 years. The National Snow and Ice Data Center maintains a database with freeze and thaw observations from more than 700 lakes and rivers throughout the Northern Hemisphere. This indicator focuses on 14 lakes within the United States that have the longest and most complete historical records. The lakes of interest are located in Minnesota, Wisconsin, New York, and Maine. Although there is a lengthy historical record of freeze and thaw dates for a much larger set of lakes and rivers, some records are incomplete, with breaks ranging from brief lapses to large gaps in data. This indicator is limited to 14 lakes with sufficiently complete historical records. The four Maine lakes and Lake Osakis only have data for ice thaw, so they do not appear in Figure 1 (first freeze date). Data used in this indicator are all based on visual observations. While the procedures for making observations of lake ice are consistent over time, visual observations by individuals are open to some interpretation and can differ from one individual to the next. In addition, historical observations for lakes have typically been made from a particular spot on the shore, which might not be representative of lakes as a whole or comparable to satellite-based observations. Considerations for defining the thaw date are specific to each lake. 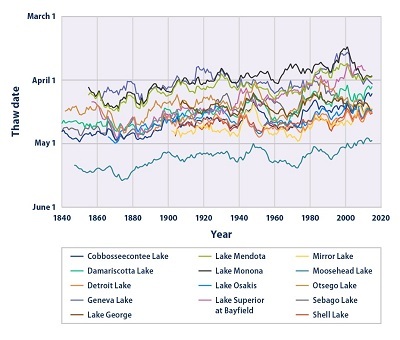 Data through 2004 for most lakes were obtained from the Global Lake and River Ice Phenology Database, which is maintained by the National Snow and Ice Data Center. These data are available at: http://nsidc.org/data/lake_river_ice. More recent data were obtained from state, local, and other organizations that collected or compiled the observations. This figure shows the “ice-on” date, or date of first freeze, for nine U.S. lakes. The data are available from as early as 1850 to 2015, depending on the lake, and have been smoothed using a nine-year moving average. This figure shows the “ice-off” date, or date of ice thawing and breakup, for 14 U.S. lakes. The data are available from as early as 1850 to 2015, depending on the lake, and have been smoothed using a nine-year moving average. 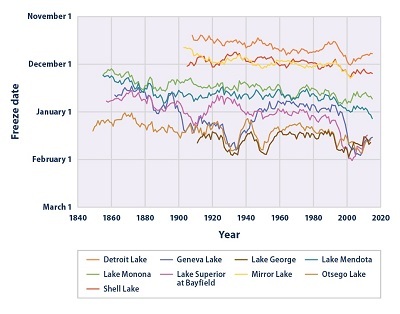 This figure shows the change in the “ice-off” date, or date of ice thawing and breakup, for 14 U.S. lakes during the period from 1905 to 2015. All of the lakes have red circles with negative numbers, which represent earlier thaw dates. Larger circles indicate larger changes. Reference map for figure 3 above.